Angamuco, a city located in the west of the country, half an hour from Morelia, was built by the Purépechas, the enemies of the Aztec empire. With an area of ​​26 square kilometers, the finding showed that it had the same number of buildings of the island of Manhattan. Specialists on the field are really enthusiastic about what Lidar technology can unveil in America. Archeology is celebrating again its good luck. The impressive find of a Mayan ‘megalopolis’ in Guatemala is cause for amusement and wonder. The new laser mapping techniques are rewriting history at an unprecedented rate, discovering, again and again, cities that we did not know. The last "new old city" is located in Mexico. This is Angamuco, a city located in western Mexico, half an hour from Morelia. It was built by the Purépechas, the enemies of the Aztec empire. And, in addition, it is the largest city of that civilization, with an extension of 26 square kilometers. "To think that this huge city existed in the heart of Mexico during all this time and nobody knew it was there, is something surprising", said to "The Guardian" Chris Fisher, an archaeologist from Colorado State University who presents the latest findings of the study this week. Although less known than the Aztecs, the Purépechas were a great civilization in central Mexico at the beginning of the 16th century, before the arrival of the Europeans. The cities we knew about the Purépechas include the imperial capital Tzintzuntzan, which lies on the edge of Lake Pátzcuaro in western Mexico, an area where modern Purépecha communities still inhabit. 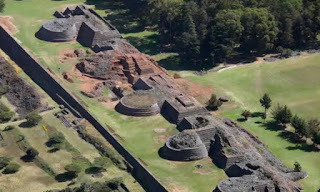 Using Lidar technology, researchers have discovered that Angamuco (which was only known in part), was more than twice the size of Tzintzuntzan, although it was probably not as densely populated. "This is a huge area with lots of people and a lot of architectural remains", Fisher added. "If you do the math, you suddenly talk about 40,000 buildings, which is about the same number of buildings of the island of Manhattan." You can ‘wow’ now! The researchers have also stressed that Angamuco has an unusual structure. Open squares and pyramids are located on the edges of the city, instead of in the center. According to Fisher, it is believed that more than 100,000 people lived in Angamuco at its peak, which occurred between 1000 and 1350. "It would become the largest city we know now in western Mexico during this period", the researcher said. Archaeologists discovered the city in 2007 but used traditional techniques to map it. The conditions of the land did not allow them to advance quickly, so already in 2011, they began to use the Lidar technique, which is what has led them to this great discovery. "Wherever you point the Lidar instrument you will find new things, and that's because we know very little about the archaeological universe of America at this time", said Fisher. "Many of these areas of America that we see today and that we think are tropical forests were really abandoned gardens", he concludes. No doubt, the hands and brains behind the discovery of material culture must be exited both about the possibility of counting on such modern technology and the amazing findings that are brought into light.